Midwinter Furnace Woes to Avoid | Fresh Air, L.P. This component measures the temperature in the combustion chamber of your furnace and shuts off the burner and blower fan if it becomes too hot. This is part of the regular heating cycle of your system, but it’s also a safety mechanism. So if the limit switch malfunctions or fails, then your furnace might not turn on when the thermostat signals for it to, or it may continue to run and fail to turn off. Even if you have a gas-powered furnace, it does use at least a little bit of electricity in order to function. Most of that electrical power goes to the blower motor, which circulates air through your furnace, then through your living space. If this motor’s bearings wear down, it loses its lubrication, or gets too infiltrated with dust and debris, and therefore is at risk of burning out. Sometimes, you might catch this before it happens by listening for a screeching sound from the furnace or acrid odors from the vents. In this case, you can call in a pro for immediate repairs. If the motor does burn out, you’ll need an HVAC pro to replace this component. This is the name given to the process where a furnace cycles on and off rapidly, instead of in regular cycles. Therefore, it never completes a full heating cycle. This symptom indicates a few potential problems, including a miscalibrated thermostat or even a clogged air filter (replacing your air filter with a clean one is something that you can and should do on your own). 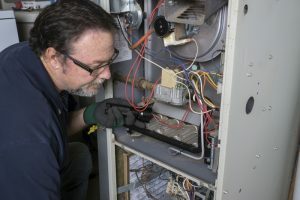 But overall, the actual act of short-cycling means that your furnace doesn’t have sufficient time to distribute heat, and it’s stressed as well. What’s wrong with a stressed furnace? Well, it creates more and more repair needs and wastes your money since the heating system will be expending more energy than necessary to try to do its job. This is a dangerous problem that typically only afflicts aging furnaces, but you should know the signs. Cracks in your heat exchanger can lead to carbon monoxide exposure, which at its most minor can contribute to sudden onset flu-like symptoms and at its worst can even be fatal. We implore you to have a carbon monoxide detector installed in your home, and if it goes off, please evacuate immediately and call for emergency services! You are more likely to avoid this particular problem altogether with regular care and maintenance from a pro, so be sure to call on our team. For quality heating services and more, contact Fresh Air, L.P. today!